This week I am featuring the jewelry set made by Kenneth Begay for Cleora Helbing. Begay is known as the father of modern Navajo jewelry. He created clean, elegant designs based on streamlined shapes that were repeated to form balanced and harmonious patterns, a style that has been compared to Navajo weaving. 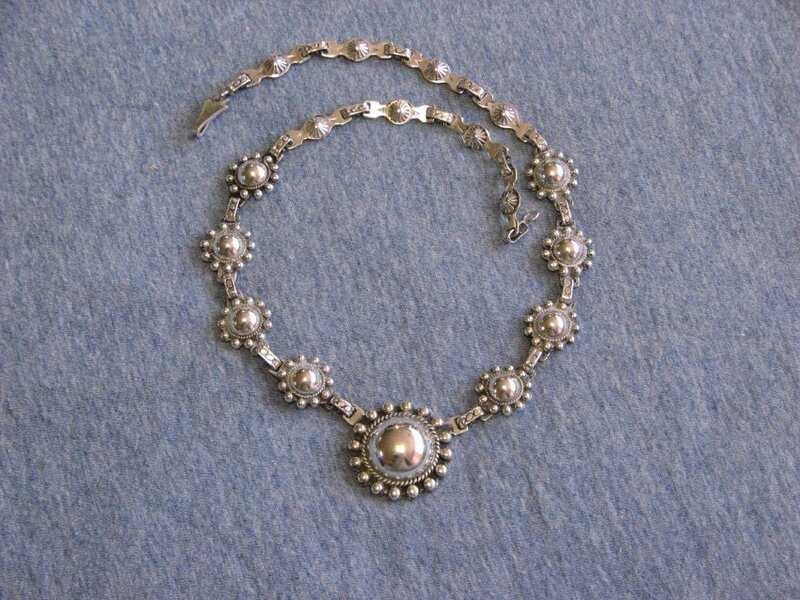 Cleora wrote “This silver necklace is part of a complete set of jewelry, made for me by Kenneth Begay, a full-blood Navajo who was married to Mrs. Bryan’s daughter. Mrs. Bryan taught weaving at the Fort Wingate Indian School, Fort Wingate, New Mexico. The particular design of this necklace is that of a moon surrounded by small round stars. A large moon-star pendant hangs from the center of this necklace, and four smaller moon-star lobes hang on either side of this. 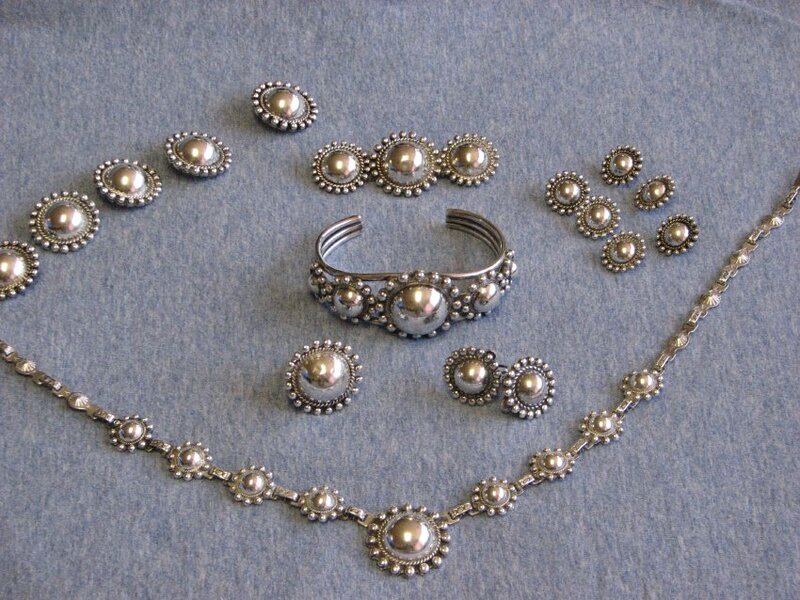 The necklace was made exactly to fit my neck, and I have worn it for many years while I was in the Indian service.” The set also contains a matching bracelet, earrings, ring, brooch 5 large and 6 small buttons. In November and December of 2008, these pieces were carefully cleaned using a slurry of Calcium carbonate in water. This was done at the suggestion of Bob Herskovitz from the Minnesota Historical Society. It was really fun to see the beautiful silver emerge from under years of tarnish. This entry was posted in Collection Notes and tagged A-Z, Cleora Helbing, Ken Begay, museum collection, Native American art, Navajo, silver, Silver jewelry. Bookmark the permalink.